Rasmus from the Danish BlogMagasinet asked in one of the recent podcasts, how we use blogs to meet people. So I figured I’d tell about how I’ve used it here in Prague. Before I moved down here I search on google.com, technorati.com, blogbot.dk or overskrift.dk for people blogging about Prague in either Danish or English and I found two Danes. The first one is Laus SÃ¸rensen. Laus runs the vacation agency Prag Eksperten and has made a business from renting apartments and giving tours to Danes. 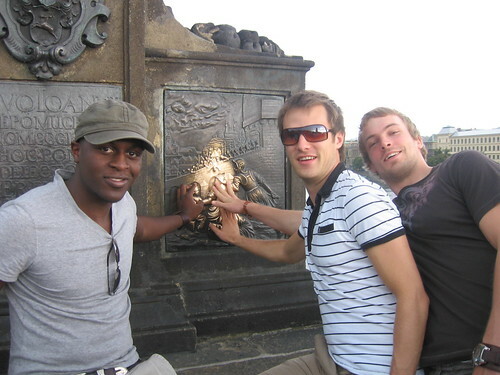 He is blogging at prag.urbanblog.dk were he writes about the city, his business and his friends. As a newcomer in town there is definitely some good information about the city and his company site has the most comprehensive site about Prague in Danish. 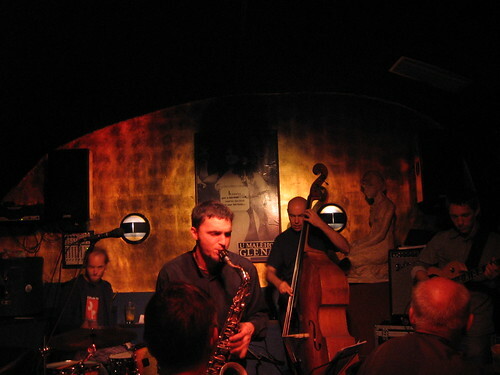 A couple of weeks ago I went to dinner with Laus at U Maleho Glena (picture above) a very cool jazz spot in Prague. We talked about the city, running businesses and realized that we both have parents in Jylland so maybe we can carpool to Denmark sometime. The second Dane is Holme but he is actually not in town yet. He is going to stay in Prague for a year with his Czech girl friend while studying. I think he is moving down here sometime in August so I’ll try and see if I can catch him over a pivo sometime. In my daily life I only speak English – apart from when I’m calling home – so it’s nice that there is a few Danes in town. [Update 18/9 ’07] Just came across another Dane in Prague called Pavel-Helge – he has a lot of updated info in Danish about what’s going on in Prague. [Update 14/1 ’08] Just came across another Danish blog about Prague called Prag HotSpots by Jens Gregersen. Back in 1631 a Swedish army invaded Prague and now they are back! – This time with a more peaceful aim. Backsell the Swede was an intern in Michigan at the same time as Femi and I and after spending a year in Germany him and Toni (another Swede) did a trip of central Europe before heading home. It s a weekend of Swedish style drinking, snus chewing snus ing and partying sprinkled with a little touristy activities in the mix.